To pick up where I left off yesterday... the plan was to check my bike into transition before a team meeting for filming at 5 pm. I got my bike out of the hotel bike check and noticed the front tire seemed low again. 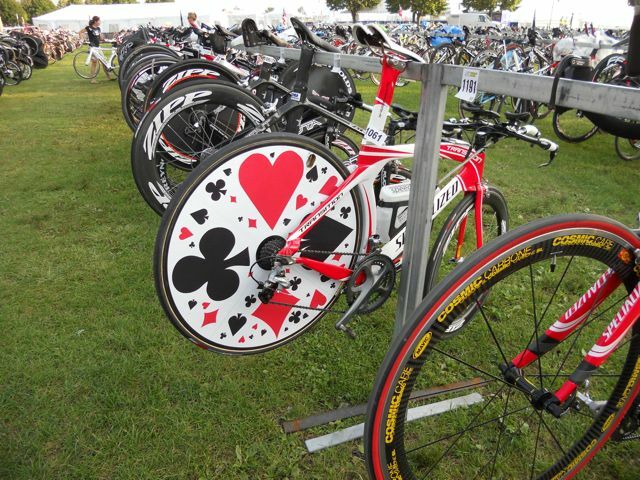 I pushed the bike about a half mile to transition for the bike folks to check it out. We discovered the front had a slit and the best fix was to put a tube in my tubeless tires but they couldn't do it there, so I pushed/sprinted with my bike about a mile to the local bike shop, SkiRak (which is amazing). I dropped it off there and sprinted back to meet the team. I was frustrated but my mantra this weekend has been to just "roll with it." I knew there was a lot of uncertainty and things would happen. I couldn't get flustered and let it affect my fun or positive race energy. I met up with the team where we did a some filming and had a lot of fun with it! Then I dashed back to the bike shop and finally got my bike into transition. I said night-night to Teddy Roo and got back to the hotel. 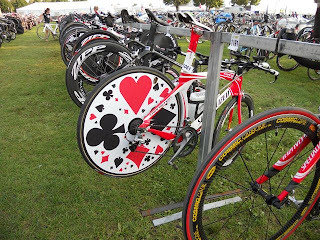 I've never seen so many beautiful bikes...check out this wheel!! 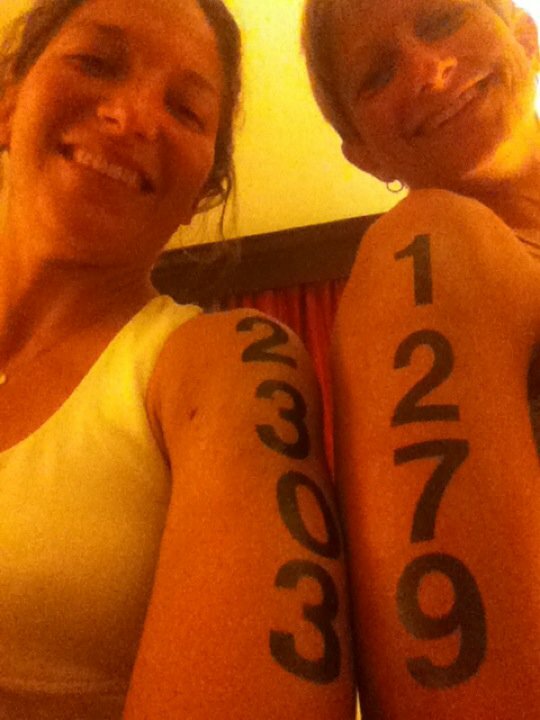 For this race they give you "Tri Tats" which are temporary number tattoos for your shins and arms. At most regional races they just use Sharpies. Kimberly suggested we put the tattoos on the night before which was a good thing, because it took some time. We both made a classic rookie mistake and forgot to take the plastic off one number, thus transferring the number not to our skin, but to the plastic. Luckily she had a Sharpie and we just improvised and wrote those numbers in! I slept great, got up, ate my usual oatmeal, had some electrolytes and water with Scivation Xtend (BCAAs). I headed to transition and was getting organized when I heard a voice and saw a person who I swore was Tara, the winner of The Biggest Loser (I forget what season). Last winter and spring I watched reruns of that show while I rode on the trainer and she was my favorite contestant. She won every challenge and just never ever gave up on herself. So I went over and asked if she was Tara, and indeed, yes! She seemed kind of nervous like the rest of us and we had a conversation about nutrition on the bike. 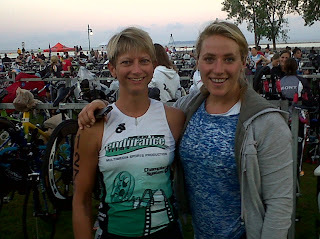 We compared plans and decided we were both OK. She's training for Kona and this was a training race. She planned to add onto the run to get a solid training day in. I was so jazzed to meet her!! 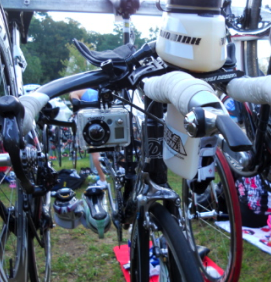 The last pre-race thing of note is that Eric and Danny of Endurance Films asked if they could put a small camera on my bike to record the course. It was maybe 6 ounces or so but what the heck. It recorded audio too so on a few occasions I added in some commentary. Some was intentional, some (the sailor talk) was not. 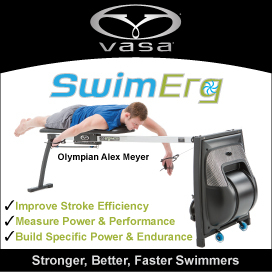 With everything set to go....it was race time!! !